October is a weird and wonderful time of year. It’s the one month where children and adults alike embrace their inner ghouls in the spirit of Halloween. This makes it a perfect chance for businesses and individuals alike to show off their creativity. Through the use of laser cut acrylic, we at Vector & Raster have had the pleasure of assisting businesses across Melbourne in turning their stores into creepily-crafted works of art. 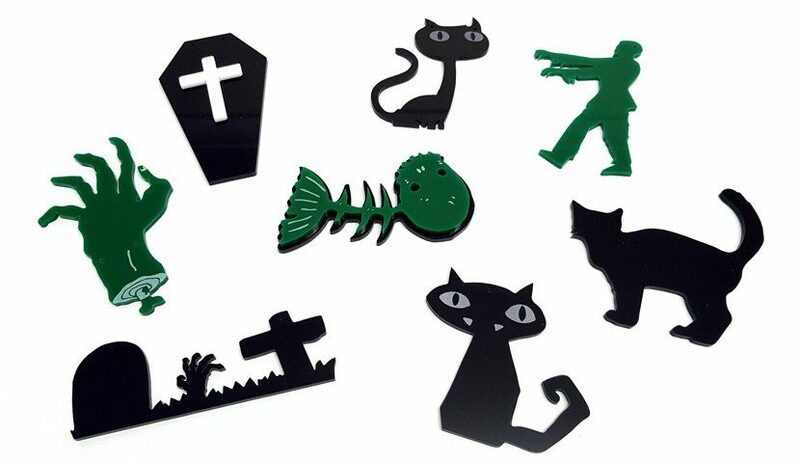 So, if you’re thinking of using laser cut acrylic to prepare your business for Halloween, Vector & Raster has you covered. Due to its high durability and even higher level of versatility, laser cut acrylic is one of the most popular options for creating detailed designs that will last. It is also tremendously easy to work with; meaning it can be folded and formed to suit any job that requires fabrication. When using laser cut acrylic for designs, you’re also provided with charm and quality in buckets, as can be seen in our examples above. This small selection of characters and silhouettes are laser cut from 3mm acrylic in greens, whites, and blacks. While there is a wide array of colour options available, most offer a high-gloss surface, making acrylic a fantastic pick for eye-catching creations. That said, if a gloss finish isn’t your cup of tea, acrylic is also available in a satin or frost finish, as well as coloured mirror, fluorescent, and many others. These designs also showcase the effectiveness of mixing laser cut acrylic with laser etching. From minute details on a fishbone’s tail to the eyes of a black cat, laser etching on laser cut acrylic brings out so much more character and style than is possible with most cutting alternatives. In other words, no matter how detailed your vision is, laser etched acrylic is a surefire way to bring your creativity to life. At Vector and Raster, we pride ourselves on delivering exceptional workmanship regardless of job size. This is an ethic that can be seen through each and every one of our services, from wood engraving to fashion designs. Plus, with over 20 years of experience in the laser cutting industry, you can be sure that your project is being taken on by professionals. For more information on acrylic as a laser cutting material, click here. Or, if you’re looking to learn more about what Vector and Raster can do for your next laser cutting project, contact us today! Happy Halloween everyone!